The Chester County Water Resources Authority produced the County-wide Stormwater Management Plan, called Watersheds. This Plan was adopted in 2002 as the water resources element of Landcapes and was updated in 2013 with the County-Wide Act 167 Stormwater management Plan Addendum. 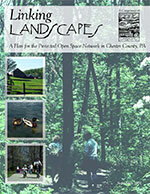 This plan was adopted in 2002 as the open space element of Landcapes. Copies of the entire document are available for review at each municipal office in Chester County, at the Chester County Planning Commission office, and at each of the 17 County public libraries.